A double-sided wood fireplace – also called a see-through or 2-sided fireplace – would add a stunning focal point in your home! Like fine art that warms and lifts the soul, your new fireplace will transform your home in ways you didn’t think possible. Acucraft manufactures five see through models offering you a variety of choices for your see-through fireplace. Like our standard single-sided fireplaces, we start with 7 gauge (3/16”) steel, and double weld all major seams. Every moving part is pre-engineered for safe, trouble free operation. When it comes to door systems, Acucraft glass doors are second to none. High temperature ceramic glass (lifetime warranty) installed within a rugged 10 gauge steel frame (with full perimeter gasketing) comes with a double pinned top and bottom latching system for a long term seal. All of our wood burning see-though models can be installed as indoor outdoor fireplaces. The Unity fireplace unifies modern aesthetic or more rusting settings with the benefits of high-tech wood burning. Clean and Flexible. Available in 36, 44, 48 – arched or rectangular front with single or double door options. Our see-through fireplace system is viewable from two sides and made for built-in-wall applications. A see-through fireplace creates a spectacular visual effect. The Hearthroom Series Zero Clearance Fireplaces offer an expansive arched or rectangular viewing area and the signature Acucraft quality and craftsmanship!. Designed for both life and style, the Chalet offers a majestic presence in any room. Acucraft will construct your Chalet Fireplace technically flawless and aesthetically perfect. Our Greatroom Fireplace is an extraordinary fireplace that is truly the focal point of any room. With a burning time of up to 12 hours, it’s worth a second look for more details! Capture the unique essence of the Lodge Fireplace in your own home. Provide hours of warmth, comfort and a welcoming gathering room. 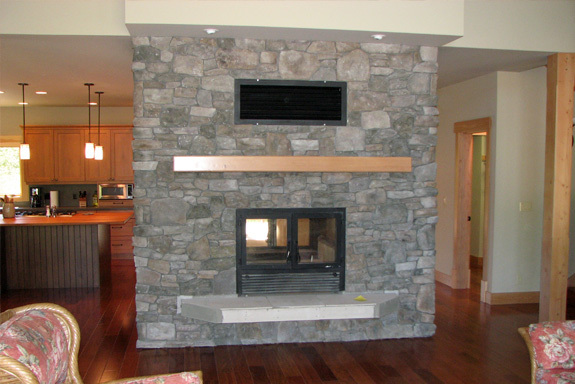 Have Questions About Our 2-Sided Wood Fireplaces? Contact Us! We have Fireplace Specialists available to answer any questions you may have about our fireplace products. Please give us a call at 888-317-6499 or visit our Contact page.